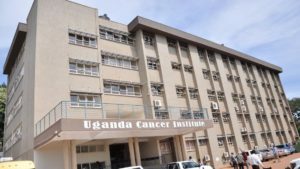 The Uganda Cancer Institute in Mulago. Less than 10 percent of children developing cancer receive treatment at the cancer institute according to authorities. A senior official at the Uganda Cancer Institute (UCI) has said more children are dying of cancer every year than HIV/Aids. According to Dr Joyce Balagadde Kambugu, the UCI head of pediatric oncology, whereas about 3,000 children are diagnosed with HIV infections every year, an estimated 7,000 children develop cancer every year, with kidney, bone and blood cancers the most common ones. Dr Balagadde said the situation is worsened by lack of information about causes of cancer in children and the prevention measures. She also expressed concern that many parents are now aware of the phenomenon, arguing that there is delayed referrals of the affected from the lower health units and hospitals, inconsistent access to cancer drugs and medicines and prohibitive costs of travel to access specialized paediatric cancer care. For example, Dr Balagadde said, less than 10 percent of those developing cancer receive treatment at the cancer institute, adding that UCI received only 512 referrals of children in 2017, up from 476 in 2016. “We do not know where the rest of the children are, meaning they maybe outside there dying,” she said. However, she said childhood cancer is curable, with an 80 per cent success rate in developing countries and 55 percent in Uganda. The revelation comes ahead of this year’s International Childhood Cancer Day, which will be celebrated on February 15. According to data from the World Health Organization’s cancer section, childhood cancers have risen across the globe by 13% in the last 20 years, with 140 in every million children diagnosed with cancer under the age of 14 since 2000. The report also indicates that in poorer countries, some children’s cancers are never diagnosed and their deaths are investigated. According to the Uganda Child Cancer Foundation, unlike many cancers in adults, childhood cancers are not strongly linked to lifestyle or environmental risk factors and develop rapidly owing to the weak immune system of the children and their rapid growth of cells. Dr Jackson Oryema, the Executive Director of Uganda Cancer Institute said the childhood cancer is real and urged parents take up the message on the childhood cancer seriously.